Surfing the line between cake and tart (a very nice intersection to hang out, if you ask me), this is basically a recipe for frangipane tart, minus the crust. Frangipane is a French almond-based filling that is generally topped with fruit and baked in a tart shell. 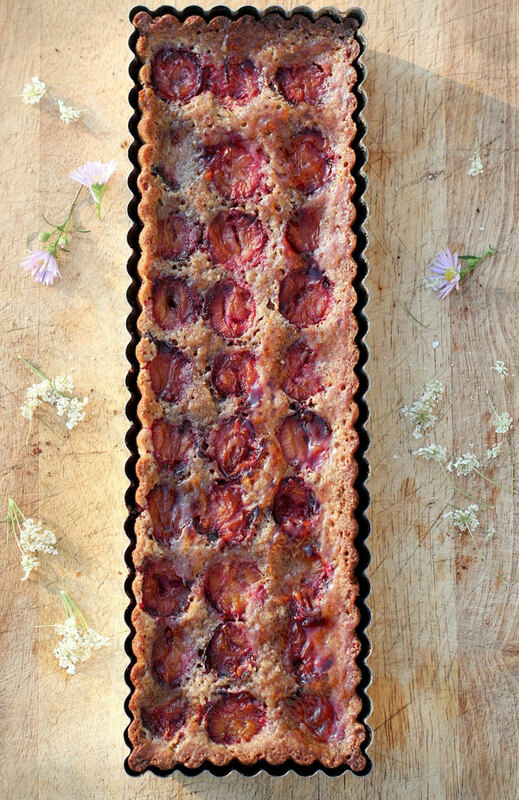 In this version, I’ve done away with the crust altogether for a quick and easy take on plum frangipane tart. It’s buttery, moist, nutty, and generally pretty irresistible. And if you bake in a proper tart plate, you’ll wow everyone! If you don’t already have a tart plate with a removable bottom, let me assure you that it’s a fine investment and you won’t regret the purchase one bit. You can easily find one at any kitchenware store and I’ve even seen them at my local home hardware store. Mine is probably my most used and prized kitchen possession. As a final note, this recipe can be adjusted to suit your tastes. Try pecans instead of almonds (rich and buttery) or pears instead of plums (mmmm). Go crazy! Either way, do make this tart! 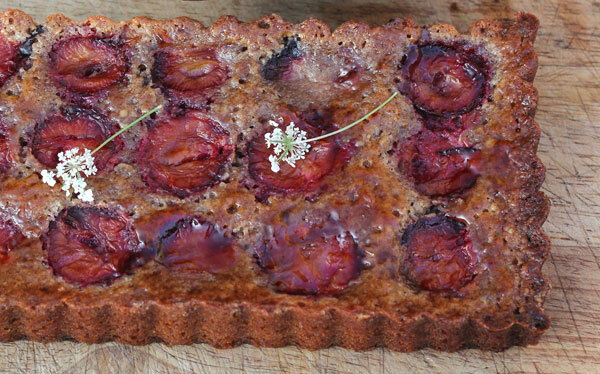 This plum almond tart recipe is a variation on a frangipane - a French almond-based filling that is topped with fruit and baked in a tart shell from food blogger Aube Giroux of the Kitchen Vignettes blog. Preheat oven to 350F. Butter a 9-inch round tart pan (or a 13 x 4-inch rectangular one) with a removable bottom. In a large bowl, cream the butter, 1 1/2 cup ground almonds and 1/2 cup sugar together until uniform and silky. Add the vanilla and eggs and beat together well. Gently add the flour, being careful not to over-mix. Pour this batter into your tart plate and spread evenly with a spatula. 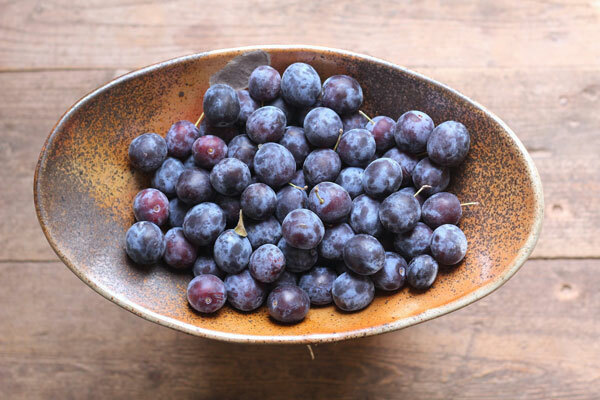 Cut the plums in half and push gently them into the batter, cut side up. Bake for 40 to 45 minutes or until a deep golden. Remove from the oven. Allow to cool in the pan for 15 minutes. Remove the tart (by pushing out the bottom of the tart plate). 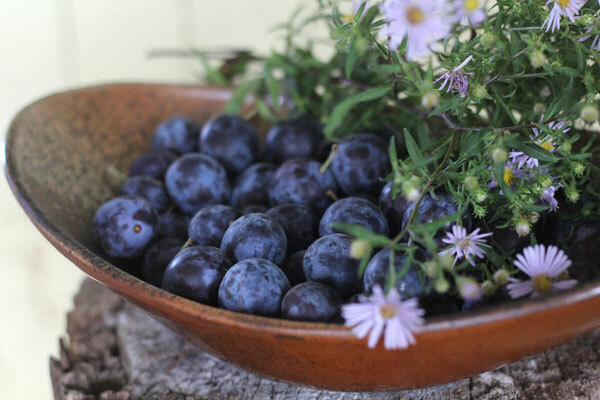 In small saucepan, combine the jam or jelly with the water or amaretto. Heat and mix together until jelly melts and a uniform glaze forms. Brush this gently onto your tart. (If you opt out of making the glaze, this tart looks very pretty sprinkled with a little confectioner's sugar).